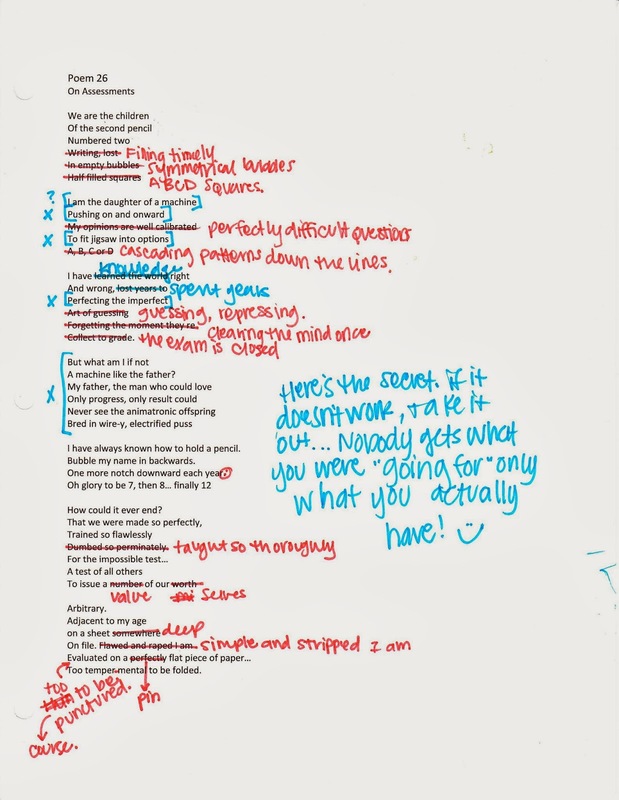 This poem came from a bit of bitterness in being accepted into college as a freshman and needing to take an assessment to demonstrate knowledge. There is something so wrong about that. The poem was origionally a little matrix-y… with all the machines and men and father business. I took things a little heavy handed with this one and wanted to make it a little more subtle. It was a lesson I learned from Wallace Stevens and his beautifully light messaged poetry. The ideas are big and broad and dangerous, but he holds them lie string attached to a derigible. I always strive for that, though it may not be so successful. On Assessments is a good example of saying too much about a subject that speaks for itself. With any kind of activism poetry, be it about war, abuse, or just schooling practices, the idea is to empower the reader to get there on their own. Present them with a scene, a truth, a sequence, and let them come to those conclusions on their own. Allow your readers to take their own stand (whish of course is your stand) but don’t tell them how to feel or why they should feel it. That subtle hint of opinon should be enough, if your cause is worth bothering over. If not, it’s not a big enough issue, or you need to present it another way. I feel that this second version is much more approachable. Much better for the reader, and easier to communicate through as the poet.